. : Farm Forest Line - Protection from stock, vermin and wildlife :. It is often necessary to protect trees and saplings from livestock, wildlife (such as wallabies and kangaroos) and vermin (such as rabbits and hares). The decision to protect your seedlings, or to implement control measures on local pests, depends upon how much damage can be tolerated by the trees before economic or severe physiological damage is caused. It also depends upon a variety of additional factors including: where the trees are planted, the level of exposure, the cost of replanting and level of acceptable loss. Larger trees can tolerate far more leaf damage than newly planted seedlings, providing there is not severe damage to the new leaf bud. Fencing is commonly used to protect trees from stock, preventing plants from being eaten or crushed and preventing stock from restricting growth by compacting soil around the roots. 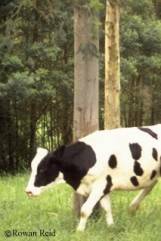 Sheep, cattle and horses need to be kept away from newly planted trees until they reach a height where young leaves cannot be eaten and to an age where they can withstand trunk damage. Exotic pests are those animals that are not native to a particular area or habitat. Different animals may be registered as pests in different states. The introduced rabbit eats a wide variety of plant species and can ringbark young trees. Combinations of fencing, shooting and mechanical (warren ripping and wool plugs) and chemical methods (fumigating and poisoning) are more effective in controlling rabbits than using these methods individually. It is important to try to become aware of what wildlife is in your area and how fencing might affect the movement of wildlife through your property. While some native animals that damage trees are pests, some types may cause negligible amounts of damage and are best left alone. 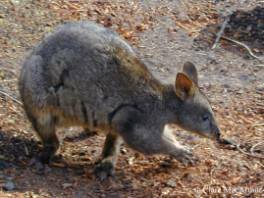 Wallabies, kangaroos and birds can be responsible for decimating trees. Land clearing and declining remnant vegetation can reduce the food choices, perhaps forcing animals to feed on seedlings as a last resort. Attempting to maintain or improve biodiversity of your property will help offer a variety of plants and organisms as food for local wildlife. Trees can also suffer extensive damage from birds. For example, Sulphur-crested cockatoos are known to rip up seedlings and chew bark and trunks in order to sharpen their beaks. They flock in large numbers and can also cause damage when roosting in trees. Strips of vegetation around seedlings can offer some protection. Contact your local council for advice on bird control measures. Scare guns have been successful in some cases, providing the guns are often, moved regularly and used as soon as the birds arrive. The cost of some of these guards may exceed the price of the seedling, take longer to install than planting and may require further maintenance to remove. Individual tree guards can be economically viable for small plantings or for widely-spaced trees. Different types of guards are available; most plastic guards are UV-stable and are supported by three stakes placed in a triangle around the seedling. Plastic guards can assist growth rate by creating a favourable microclimate for growth by protecting the plant from wind and water loss. However wind resistant guards do not encourage strong root systems. It is important to remove the guards once the seedlings have become well established so that they do not restrict further growth. Fencing can protect seedlings from domestic stock and some types of vermin and wildlife and is more cost effective than individual tree guards. Excluding stock will also prevent soil compaction and erosion. Electrical fencing may be cheaper than conventional fencing but will require regular checking and maintenance. Some types of fencing may not be effective in preventing browsing from smaller animals or possums. Protection from rabbits will require that netting is buried along the fence line to 150mm or with netting bent at the base to lie on the ground in the direction of approaching rabbits. In many localities the construction of fences may need to follow certain guidelines. For example the Fences Act in different states (Northern Territory, South Australia, Victoria) outlines provisions relating to different types of fences. Fencing should be carried out before planting and is easier when the soil is moist. Cattle and horses will require sturdier fences than sheep. No control method is full proof and regular monitoring of your trees for any signs of damage is important to determine if you are developing pest problems.